The weekend began Thursday night with the Preview Party, where patrons mingled and got the "first look" at the antiques with the opportunity to purchase. As a past attendee, I have learned the hard lesson associated with "thinking" about an item I might be interested in. Thinking often leads to a very disappointing SOLD sign upon returning... after thinking. Thinking is not recommended. This is what I tried to convey to my husband. He likes to think. I am required to "think" on certain things, but if it's something I can't live without, within reason, there's no thinking... SOLD! 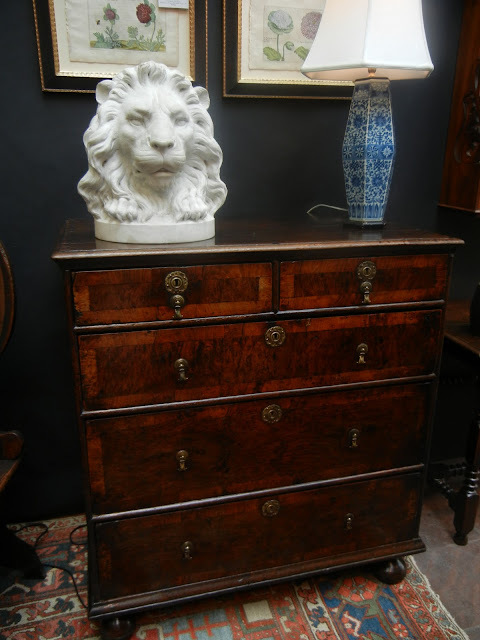 From Jayne Thompson Antiques... Exquisite, really exquisite... real statement pieces. Parrin & Co. was new to the show... and very popular! These gorgeous red intaglios were my favorite thing in her shop... they sold quickly. American Eagle Antiques was next door. I loved the color of this interesting piece. The panels turn to form a tiered table! 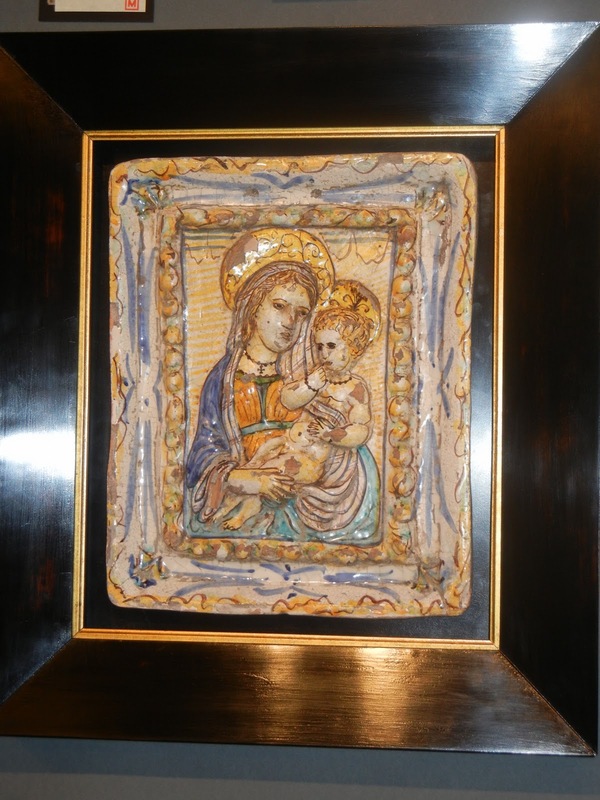 Mercato Italian Antiques and Artifacts from Kansas City is a favorite... I could probably find a spot in my house for anything and everything in Mary's booth... right up my alley. Remember my reliquary pieces from past shows? Love! PS Mary is my new BFF. Please look at that mirror! Price tag $25 a piece! Linda W. Pearce was another newcomer... do check out her website... My photo selection does not do her booth justice! Sallea Antiques from Connecticut had the most spectacular displays in the land! Right next door was Sebasky & Hildreth... I did some damage at this stop... loved the barometer. I've never seen so much miniature Staffordshire! Coveted the candlestick. Bought the candlestick. Zane Moss and his adorable wife have been around the block... I love to hear their stories. They love their antiques and talk about them like they're family. I have a bit of a love affair going on with the two of them... just darling I tell you. My heart skipped a beat at the sight of these charming french tangerines! Oh dear, I did some serious damage at Nufangle Fine Antiques & Whimsy... another newcomer from Kansas City. Intaglios, a mirror, checkerboards... stay tuned for that post! This was a popular item as you can imagine and sold very quickly! Oh heavenly Father, you know how I love globes... Isn't this one a beauty? From a new dealer, Crow & Company Antiques from Houston. So glad to have her on board! That scissor edged platter? Seriously love it. Are these two not the cutest? Ever? This little gal got me. The buckets are for salt and pepper my friends. How could I resist? I couldn't. She is now living on my kitchen counter and I love her dearly. I have added Palissy to my list of favorite things in the world. Let me introduce you to "the rug guy" aka Larry Bergman from Coulee Oriental Rugs. So love this Fortuny fabric and this gorgeous chair! Oh dear. Serious damage done at this booth. I thought these blue and white chargers were the prettiest I'd ever seen. I also bought one of a pair of mirrors. My sister-in-law bought the other... as well as the tapestry in the photo below! Will have to beg her to share a photo when she has it hung in her living room... stunning central! Earle Vandekar of Knightsbridge, Inc. I didn't get a good shot of this pair... but I think they may have been the most lovely things at the show! Show stoppers for sure. Their website is worth a visit... more gorgeousness to see! I was so caught up in the excitement, my camera battery went dead before I was able to get to each and every dealer. I feel terrible about not featuring every single one of them equally. Obviously, I got more photos of things I am specifically attracted to, but I can assure you, there were wonderful things aplenty in each and every booth! Simply spectacular. . . .Can't wait to see what you "couldn't live without" I would have been in big trouble. Phew! !...Longgg sighhh of absolute pleasure at all that eye candy, Jan! Please pretty please beg your sister in law for a pic of the tapestry!! Its in my colours and I have an absolute soft spot for tapestries!! Gorgeous Inc! Mu hat but you did quite well on your stilts...congrats...lol. Saw some great things that I would love and those urns are beauts. WOW. I think your photos are great. I don't know where to begin, but I tell ya it looks like one terrific show. 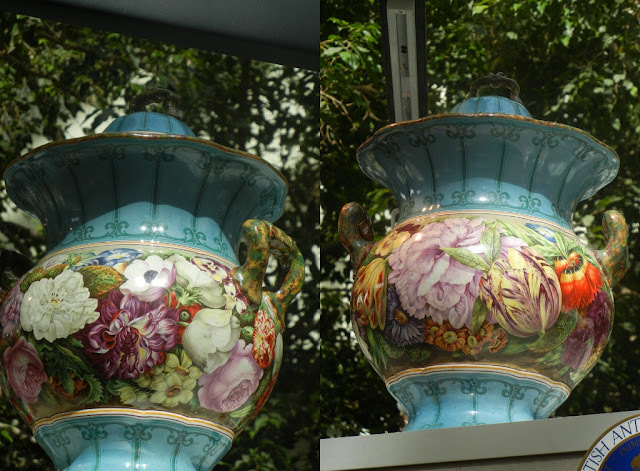 The majolica caught my eye. It is absolutely gorgeous! :D I would love to collect it, but I do not own a single piece of it. I have always been drawn to it, though. I have some Faince de Quimper Fish plates that I adore. They were a wedding gift....and I treasure them each time I use them. You always find all the beautiful treasures. I wish I could have been there. Educational and inspirational to hear these women give their opinions on good design. Wow, too many beautiful things in one place. I cannot wait to see what you purchased. I just happened to go back to tour some of your posts I missed and I am so glad I did. What an amazing collection of the French faience Quimper. I always enjoy my visits here.